The EFES-2018 Combined Joint Live Fire Exercise, one of the planned exercises of the Turkish Armed Forces which is held every two years, was conducted between April 11 and May 11, 2018 with the participation military units of friendly and allied countries. The active phase of the exercise took place between 07-11 May 2018 with the participation of 24 allied country military units in the Western Anatolia, Middle Aegean, İzmir Gulf and Doğanbey drill fields. The EFES-2018 Combined Joint Live Fire Exercise Distinguished Observer Day activities were held between 09-10 May 2018 with the participation of Chief of General Staff Major General Hulusi Akar, Land Forces Commander General Yaşar Güler, Air Forces Commander General Hasan Küçükakyüz, Naval Forces Commander Vice Admiral Adnan Özbal, as well as the Minister of Defense of Azerbaijan, the Chiefs of General Staff of Bosnia and Herzegovina, Georgia, Qatar, Kazakhstan, Kuwait, Nigeria, Uzbekistan, Romania, Sudan, the Saudi Arabia Royal Court Member and the Commander of Islamic Coalition Against Terrorism (former Land Forces Commander of Pakistan). A press briefing was held at the additional building of the Konak Officer’s Club before the night session of the Efes-2018 Combined Joint Live Fire Exercise Distinguished Observer Day, which started in the Doğanbey-Seferihisar district of Izmir. In the briefing given by Lieutenant Colonel Taner Balkan it was announced that a total of 7,500 troops from 24 countries to be involved in the exercise with Turkey. Lieutenant Taner Balkan stated that the exercise was transformed into a combined exercise with the participation of various countries in 2016 and continued, “This exercise will be the second combined joint exercise, different than the previous years, this year our number of participants increased to 23 countries from 8 countries. The experience gained through Operation Euphrates Shield and Operation Olive Branch as part of the fight against terrorism were reflected in the exercise. Moreover, the hybrid troop training and executive staff training were included in the exercise”. In the exercise, for the first time the second vessel manufactured within the scope of the Anti-submarine Warfare and Patrol Ship MILGEM ‘Büyükada’ and LST ‘Bayraktar’, CH-47 Chinook Transport Helicopters, Tactical and MALE class UAVs, ‘Korkut’ self - propelled low altitude air defense system and the MPT-76 Modern Infantry Rifle taking part in the Turkish Armed Forces Inventory were utilized. 14 governmental institutions and associations attended the exercise where 38 countries were invited as observers. Furthermore, 35 defense industry companies took part in the defense industry exhibition hall with their unique products and capabilities. Turkish General Staff, Land Forces Command, Naval Forces Command, Air Forces Command, Special Forces Command, Coast Guard Command, civil governmental institutions and associations, troops and military units from the USA, Azerbaijan, Bahrain, Bangladesh, Bosnia - Herzegovina, Algeria, Georgia, United Kingdom, Italy, Qatar, Kazakhstan, Kosovo, Kuwait, Hungary, Macedonia, Malaysia, Mongolia, Uzbekistan, Pakistan, Romania, Slovakia, Jordan and Saudi Arabia also attended the exercise”. 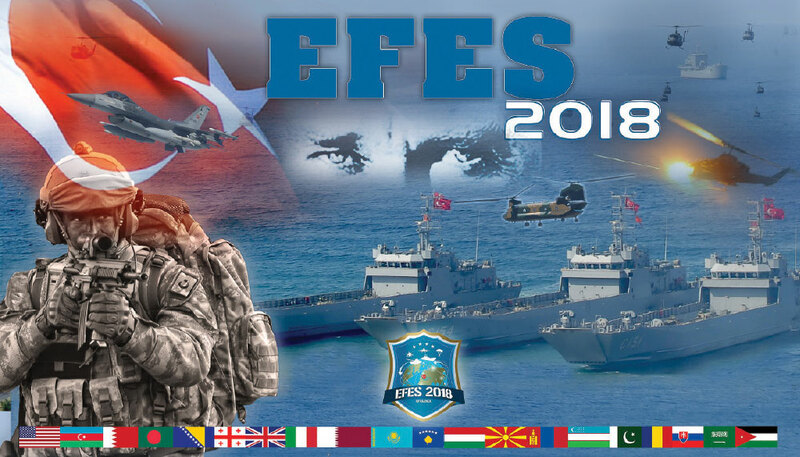 In his remarks on the Distinguished Observer Day, Chief of General Staff Major General Hulusi Akar expressed that the Turkish Armed Forces, with the principle “The greatest appreciation is confidence, the greatest success is deserving that confidence”, once again successfully executed the EFES-2018 drill and with its superior preparedness for warfare it once again proved to the world that it was constantly in the service of its nation. Underlining that with the qualified and versatile staff and the international peace support operations, Afghanistan being in the first place, the Turkish Armed Forces would always be appreciated by the Turkish nation and the world; General Akar stated that in the rapidly changing complex environment, within the scope of the ‘comprehensive approach’ based on the utilization of the national force units in a way that they support each other, the success of the exercise depends on the action of all military and civilian institutions and associations in cooperation. Touching upon the fight against terrorism, Operations Euphrates Shield and Olive Branch as well, General Akar noted that exerting utmost efforts for regional peace and stability Turkey always supported Syria’s territorial integrity and political unity within the scope of good neighbor relations, yet as the execution of a cross - border operation became inevitable for securing the security and stability in the country, Turkey taking part at the forefront at the global struggle against the ISIS, conducted Operation Euphrates Shield in 2016 and neutralized approximately 3,000 ISIS terrorists and therefore inflicted a heavy blow to ISIS. Stating that in order to maintain security and stability in the region, they launched Operation Olive Branch on 20 January 2018, General Akar added that the effective utilization of the domestic and national weapon systems, especially the unmanned air systems played a big part in the execution of the operation with outstanding success, without causing any harm to the civilians. Stating that upon the completion of the operation and clearance of the region from mines and handmade explosives, the people of Afrin started to return their homes in trust and peace, General Akar added that with the contribution of the Turkish Armed Forces in the region, the activities for rapidly covering the basic requirements - healthcare services being in the first place- of the people of the region, and the humanitarian aid activities in addition to the transport of other aid material were continuously executed. General Akar also touched upon the protection of our rights and interests in the Eastern Mediterranean and Aegean Sea and added that Turkey was on the side of resolving the existing issues in the Aegean within the framework of international law and good neighbor relations, that all types of efforts were exerted with good will for rendering the Aegean Sea a sea of peace, friendship and cooperation and at the same time underlined that the Turkish Armed Forces, with the will and determination of protecting our country’s rights and interests based on the international law and treaties, would not allow a fait accompli in our seas. Stating that the Turkish Armed Forces will continue to protect the rights and interests of Turkey and the Turkish Republic of Northern Cyprus in the Eastern Mediterranean and be the warrant of peace and security at the Island of Cyprus in line with the international guarantee and alliance agreements, General Akar emphasized that to this end, the Turkish Armed Forces adopted all types of measures with determination both in the Aegean Sea and in the Eastern Mediterranean Sea. General Akar thanked the exclusive staff of the participant countries, governmental institutions and associations, the representatives of the civil institutions and members of the Turkish Armed Forces who planned the EFES - 2018 Exercise and contributed to the successful execution of the exercise in full coordination and concluded his speech. The Night Exercise session of the EFES 2018 - Combined and Joint Live Fire Distinguished Observer Exercise was held on May 9, 2018 and prior to the night exercise, Chief of General Staff General Hulusi Akar and the visiting Chiefs of Staff visited the Defense Industry Exhibition stand area and acquired detailed information from the representatives of the companies on their products and capabilities. Following this visit, the night activities of the Efes 2018 - Combined and Joint Live Fire Exercise Distinguished Observer Day started. In line with the generic scenario of Efes 2018 Combined and Joint Live Fire Exercise, the battle between the neighbor countries Arnland and Torrike was actualized in the exercise. According to the generic scenario, upon Torrike’s occupation of the island, Arnland called for the United Nation’s help. Upon the call of the United Nations, allied troops were formed under the leadership of Turkey and with the participation of the USA, Azerbaijan, Bahrain, Bangladesh, Bosnia - Herzegovina, Algeria, Georgia, United Kingdom, Italy, Qatar, Kazakhstan, Kosovo, Kuwait, Hungry, Macedonia, Malaysia, Mongolia, Uzbekistan, Pakistan, Romania, Slovakia, Jordan and Saudi Arabia. The allied troops rescued the island occupied by the symbolic country Torrike. The night activity session was conducted between the hours 19.56 and 21.32. The Special Forces, SAS and SAT troops amphibious assault landing executed from the sea and air and neutralized the planned targets. The planned targets utilized the actual ammunition and were subject to artillery firing by the land troops while the Turkish and allied countries’ F-16 fighter jets hit the identified targets. In addition to howitzer firing, the helicopters hit the targets identified for them. Meanwhile, the SAT and SAS commandos detected the mines at sea and demined the area. As the Attack helicopters destroyed the targets identified by the Special Forces in the field, the preliminary reconnaissance was executed for the assault of the amphibious troops. In coordination with this exercise, the attack helicopters fired the identified zones as well. Additionally, the enemy forces detected at the launching areas were fired by the armed unmanned air vehicles (AUAV) utilized for the first time in this exercise. The red points representing the tanks of the opposing forces were fired through missiles while 4 T129 ‘Atak’ helicopters destroyed the targets identified side by side as well. Upon the finalization of the first air raid operation, the landing shifts completing the required landing preparations and containing the tank and armored personnel carriers approached the coast. The first wave of amphibious naval infantry forces was disembarked. During the landing, an air raid of the opposing forces towards the troops of the allied countries was responded to with counterfire with the air defense systems. The night session ended upon the completion of the aforesaid activities.